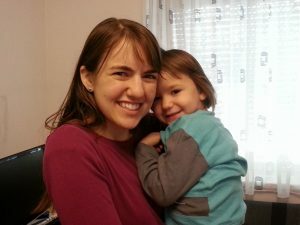 Recap of the end of blogpost Europe Trip, part 1: Liz and her mom go to Hungary to visit her mom’s sister and brother-in-law, the mission presidents in Hungary. The rain and cold try to dampen their spirits, but they are not deterred. As they travel through Budapest and Szentendre, they develop a love for Hungary and wish they could stay longer. But the train ticket calls, and they board a train headed across Hungary into the unknown city of Graz, Austria, where their cousins they’ve never met before will greet them. Will they find their cousins? 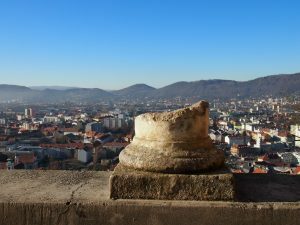 Will they fall in love with Graz? 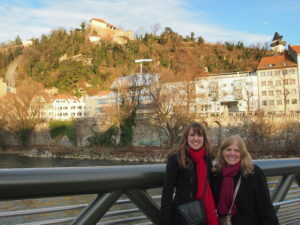 When my mom and I left on our trip, we hadn’t necessarily planned on going to Graz. We figured we would somehow find a way to meet our cousins who live in Austria, but thought they might come down to Slovenia while we were there. But as we arrived in Hungary, Iva Prus-Kern, my mom’s third cousin, started emailing me and telling us how wonderful Graz was. We had planned to take an overnight train from Hungary to Slovenia, which would pass through Salzburg, Austria, WAY out of the way. Iva insisted that we instead take the train to Graz, spend the night at her house, and then take a train from there to Slovenia. This would save us from a night on the train, allow us to meet her, and also to see Graz, Austria. Win. Win. Win. We were in, especially when she sent us the exact train time information so we knew how to get there. Alex, Iva’s husband, was the lone man standing on the train platform with a sign for Leslie and Elizabeth Stitt as we arrived. Alex gave us a lift across town to their adorable house where we met our dear cousin Iva for the first time. Family is family, guys. I love that there is a deep connection to people we call family, even when you’ve never met them before. 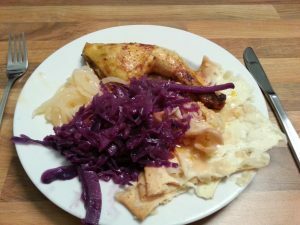 When we arrived, late at night, Iva had cooked us an excellent traditional Slovenian dinner. I. Loved. This. Food. It was like I was supposed to be eating Slovenian food all along! Iva was raised in Slovenia, but her husband, Alex is Austrian. Iva met him while she was studying in Austria and she decided to stay there to get married and raise a family. They actually came to the US for a year and a half or so for a project Alex was working on, but we weren’t really connected as well then, and never met. She is one of Tomas and Maria’s daughters, who you will meet in the next blog. Tomas and Maria have been in contact with my mom for as long as I can remember, but we started getting to know Iva with the advent of Facebook. Bless Facebook for bringing families together. After a short night’s rest, we woke up to meet their adorable little 4-year-old daughter Monika. She is way too cute. The first 10 minutes of meeting us, Monika was wary of these strangers in her home. But she quickly warmed up and she and I became fast friends. Love knows no language barriers for a child. She speaks German and she’s learning a little bit of Slovenian, but English would have been a stretch. But it’s ok because I know a lot of German words and phrases like, “Was ist das?”, “das ist gut”, “danke”, “nein, nein, fraulein” and “guten tag”. I also know “bratwurst” and “Volkswagen”. So…I don’t really know a lot of German words. But she showed me all around and let me play with her and I learned a lot of German words in a short matter of time. The best part is that she loves this little stuffed animal penguin, and penguin=pinguin in German. That occupied much of our conversation. I love this child. So, so cute! 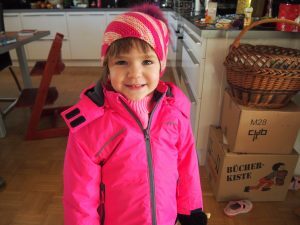 After we got ready, Iva and my mom and I walked Monika to Kindergarten. Yes! Another German word that I actually know. 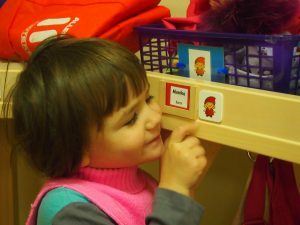 She showed us her nametag and her designated place to put her things. So precious! 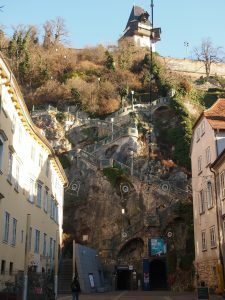 Stairs leading up to Schlossberg (Castle Hill). This is the site of an old fortress, which was largely destroyed by Napoleon. It is now a public park. Alex had to go to work, and Moni had Kindergarten. 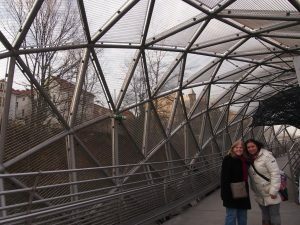 Luckily, Iva was in the middle of getting her own art business up and going, so she could take off some of her time to show us around Graz. Also, Iva’s art is awesome, so check her out at IvaKernArt.com . Iva gave us the grand tour of Graz and it’s a lovely city. Austria felt oddly less foreign to me than Hungary did. The German seemed almost familiar. I guess English really must be a Germanic language, and probably my German heritage from the other side of my family was expressing itself as well. We rode a funicular railway up to the top of the mountain to look around. 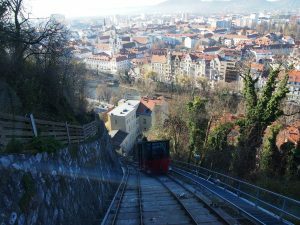 (For those of you who didn’t learn this already from Wikipedia, funicular railways are inclined cable railways to move trains up and down steep slopes. The ascending and descending trains counterbalance each other.) It’s rather steep and kind of crazy, but lots of fun. 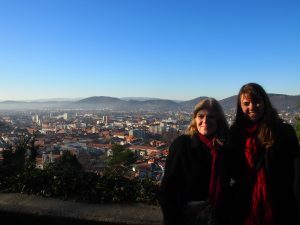 Mum and I at the top of Schlossberg, overlooking Graz. Gosh, it’s beautiful. One of the best things about going to Europe in December is there are Christmas markets everywhere! It was so fun to see all the hand crafted treasures people had made. 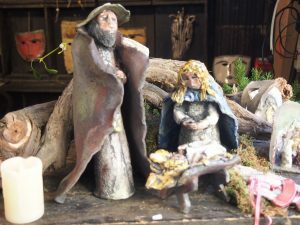 I especially loved all the handcrafted nativities and wish that I had enough money to buy them all. Alex was able to take his lunch break and meet us for lunch at a traditional Austrian restaurant in town, right next to the Glockenspiel (one of those tower clocks that opens up when the bells ring and has dancing figurines–unfortunately it only plays a few times a day, and we weren’t there to see it). The waiters were dressed in lederhosen. Too. Much. Fun. And my dish? Pumpkin lasagna–pumpkin is kind of a big deal over there, and not just at Thanksgiving (because, well, they don’t celebrate our Thanksgiving). Another awesome thing about Europe is all the old cathedrals. So beautiful and historic. 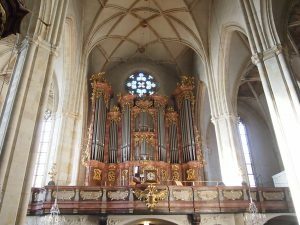 I loved all the magnificent pipe organs. Mom and Liz in cute black coats, cute red scarves, and sling purses. Are we related? Yes, yes we are. Schlossberg in the background. Iva and my mom on the Island in the Mur. This is an architectural structure in the middle of the Mur River that runs through the city. The island hosts a small restaurant and concert venue. 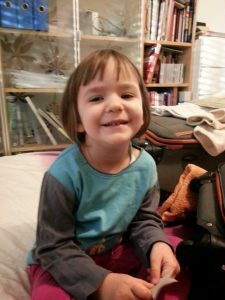 In our whirlwind, less-than-24-hours-in-Graz, the most wonderful thing is we got to know Iva and build a deeper connection with her and her family. I feel like we will be friends forever. She is so friendly, smart, funny, and kind. 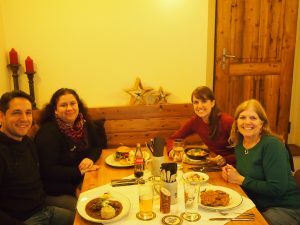 What a blessing that we changed our plans to include a day in Graz and get to know Iva, Alex, and Monika.